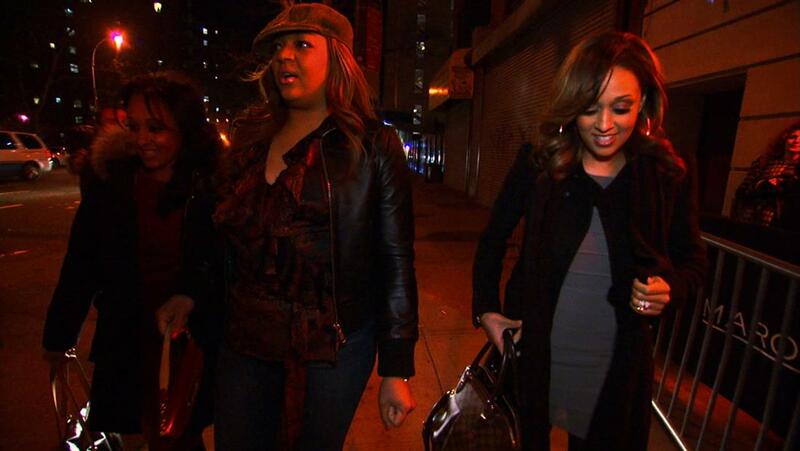 The girls head to New York City where Tamera struggles to present a more grown-up image to fashion magazine editors. Tia sets out to prove to her sister that moms know how to have fun. Tia & Tamera are both nervous about going back to work in front of live audiences. Tia feels vulnerable without Cory to coach her, while Tamera hopes to be heard amongst 4 alpha females. Tamera's talk show is picked up, but it means she'll have some difficult changes to make. Meanwhile, Tia poses for a PETA ad campaign and hires an assistant that crosses the line. Tamera questions whether she and Tia are identical twins and convinces Tia to take a DNA test. The twins move forward developing their newest product, but can't agree on the scent. Tia asks Tamera to be Cree's legal guardian, but the feeling isn't mutual when it comes to Aden. Tia also considers stardom for Cree. The sisters argue about launching a second product. Tia discusses another child with Cory. Tamera auditions for a talk show amidst stiff competition. Later, the sisters consult a communication expert. After an unflattering picture appears online, Tia wrangles Tamera and Jerome into going to a military-styled boot camp. There, Tamera settles unfinished business with Tia. Tamera misses Tia's pilot party due to a health scare. Jerome takes Tia on a zip line. Tamera tries reconciling Andrea and Tia. Meanwhile, Tia conspires to make-over Tamera's wardrobe. Tia and Tamera head to Las Vegas for a fun girls' weekend where they attend a drag show. Tamera is forced to choose between her husband and a celebrity poker tournament with Tia. Tia performs in a burlesque show to prove she's still got it, while Tamera decides whether or not to attend a poker tournament in Vegas. Tamera gets more proactive in her career and begins developing a sitcom project with her friend Amy. While waiting to hear if her pilot will be picked up, Tia attends a red carpet event. A look back on the ups and downs, comedic moments and heated sisterly feuds from the first two seasons of Tia & Tamera. Tia and Tamera watch moments from the show together and comment on how they really felt and if they would have done things differently, from wedding day drama to life in front of the camera. Tia feels left out of Tamera’s pregnancy and receives unwelcome news about the fate of her pilot. The twins pitch their product, Milky!, to Destination Maternity and baby Housely is born. Tia takes a strip dancing class for Cory. Tamera clings to her freedom before the baby, pushing for a final night out. She and Adam must tackle questions about their son's racial identity. The twins make major headway with their lactation tea drink idea while Tamera worries about postpartum depression and debates whether or not to post pregnancy pictures online. A very pregnant Tamera keeps herself busy by getting in on Jerome's album recording session, and building her baby nursery, while Tia stretches herself thin when she makes a yoga video. Tia plans Tamera's Napa baby shower, but Tamera has a tough time letting go. Tamera enlists Tia's help in brewing a lactation tea, which leads them to some unexpected results. After months of unemployment, Tia starts gardening, but when she receives an unexpected offer, she must make a career-changing choice. Tamera hires a doula as she plans for a natural birth. Tamera orchestrates a pop-up shop benefiting a local charity while Tia struggles with posing for a bikini shoot and tries to find a solution to Cree's restless sleeping patterns. The twins head to the Bahamas to learn more about their ancestry, but while Tia chases leads, Tamera struggles to keep the trip a true vacation even after they’ve lost all their luggage. After leaving "The Game" Tia uses her free time to plan Cree's first birthday party, while Tamera investigates if her dog Milano is sick when he starts acting strange. Tia must make a big decision about her role on "The Game," while Tamera struggles with her new role as a working mom when she starts filming a TV-movie while 5-months pregnant. Tamera makes a thrilling discovery, but then has to keep it a secret. Tia has to get new eyeglasses while her plans for her very first Mother's Day get dashed by preparing for her book tour. Tamera tries to get the Napa house ready for her housewarming party and Tia leaves Cree behind for the first time when she heads to Napa causing her to deal with separation anxiety. Feeling crowded in her condo, Tamera thinks it might be time to move, and Tia struggles with her body-image while carrying those last stubborn pregnancy pounds. While Tia teaches Cree baby sign language and Tamera prepares to deliver a speech at a high school, the sisters' failures in their own communication force them to seek professional help. Tia stresses about a suspicious mole on her neck. Tamera contemplates expanding her family and tries babysitting Cree, but an anxious Tia goes overboard to make sure everything is alright. Tamera and Jerome visit Tia in Utah to give her the family support she's been missing and find Tia trying to balance the movie, taking care of Cree and that she may be expecting baby #2. When Tia misses Cree crawling for the first time, she reevaluates her balance between work and motherhood. Tamera must take a step back from pilot season or risk burning out in her job hunt. Tamera struggles to find balance between her life in LA and her new home in Napa. Tia's "to do" list overwhelms her before she leaves to shoot her movie. Tamera tries to prove that she can split her time between her Napa home & LA. Tamera feels betrayed when Tia fails to tell her about her new role. Tia struggles with life as full-time mom. Tamera takes a once-in-a-lifetime journey to South Africa with Adam. When Tia turns down the trip, Tamera asks her cousin Jerome to come along, but will he end up feeling like the 3rd wheel? Tia's baby boy, Cree, finally arrives and Tamera starts thinking about a family of her own. Tamera gets asked to cohost a live TV show and helps Tia out while she's on bed rest. Tia is put on bed rest and hires a decorator for her baby's nursery. Tamera preps herself to re-enter the acting game. Tamera struggles with Adam moving in and learning how to share her space. Tia has her baby shower. Tamera is left in tears when she and Tia vent their frustrations regarding the wedding weekend. Bad weather and Tia's late arrival threaten to turn Tamera's dream wedding into a wet disaster. Tamera prepares for her bachelorette weekend. Tia has to decide on a birthing plan. Tia's pregnancy keeps her from fulfilling her Maid of Honor duties for Tamera's wedding.